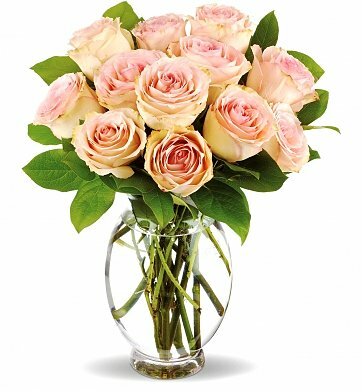 To show friendship and devotion, send a dozen elegant roses in a shade of delicate pink. It's a classic choice that always expresses your best wishes. One dozen blooming, 50 cm pink roses are chosen for their freshness and size, then arranged in a glass keepsake vase with accents of salal. Simply beautiful. Upgrade to the Deluxe version for 18 roses and the Premium Version for 24 roses. One Dozen Pink Roses (50 cm). Measures approximately 14" x 16". Delicate Dozen Pink Roses is a hand delivered gift. These gifts are delivered by one of our local design centers located throughout the United States and Canada. Same day delivery is available for most gifts when ordered before the cutoff time. The cutoff time for Delicate Dozen Pink Roses is 2 PM in the recipient's time zone. Everything was perfect and my friend was very happy with the flowers. Getting pink roses is a great feeling, getting pink roses makes a person feel speacial to the person who sent the pink roses to you. You can send pink roses for any special occasion most of the time people send pink roses for a gift of love when they want show a particular person how they feel about them . Sending pink roses is a very good way to show that.